March 30, 2018, 4:28 p.m. 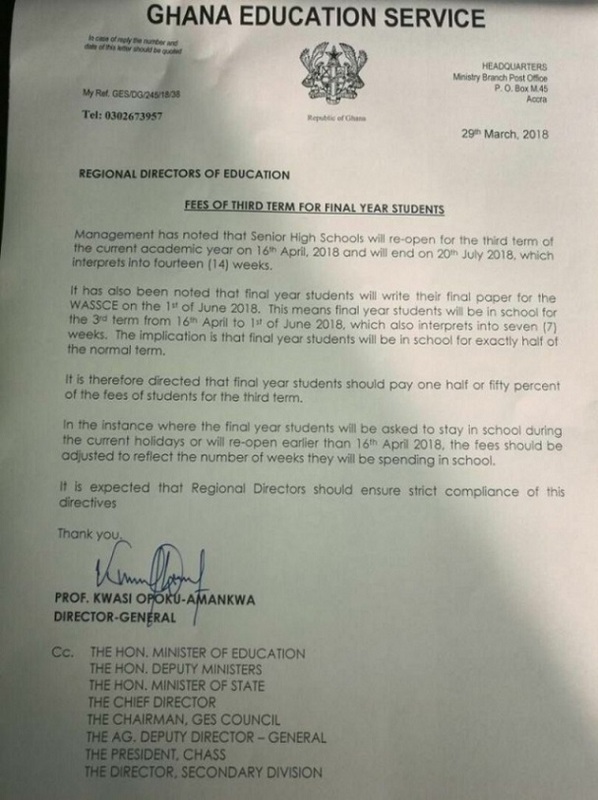 The Ghana Education Service (GES), has directed that public Senior High Schools only charge final year students half of the third term fees for the 2017/2018 academic year. This is because the students, who will be sitting for the 2018 WASSCE examinations will spend only seven weeks in school instead of the full 14 weeks. “It is expected that the Regional Directors should ensure strict compliance of this directive,” the memo added. Schools are set to re-open for the third term on April 16, and will vacate on July 20, 2018. The final year students are expected to be in school up till June 1. The memo added that adjustments could be made if students are made to stay through the Easter vacation. The West African Examination Council, WAEC, announced in February that final year SHS students will henceforth write the West African Senior Secondary School Certificate Examinations (WASSCE) in April. Head of the West African Examination Council (WAEC), Rev. Samuel Ollennu, said the move will guarantee that the nine terms allocated to teaching and learning in second cycle schools are fully exhausted by students before the examination. “We are here to sanitize you about the forthcoming examination, which this time around is not starting February but on April 3. Formerly, we were going to start in February but the government appealed to us not to”, he said. In November 2017, the Minister of Education announced the proposal, citing that students need adequate time for preparation, and after consultation with the West African Examination Council (WAEC), the date was reviewed.